ALL of the birds are really fantastic. I am always satisfied with all of my purchases from this shop. Making Headpins for charms or earrings, is one of my favorite things to create. I get to make beads. Not a bad life. How did I get started? I get asked that all the time. So what's the answer...I was a Sculpture major at UNCG and after graduating I didn't know exactly what it was I wanted to do. But I did know that I wanted to Create!! 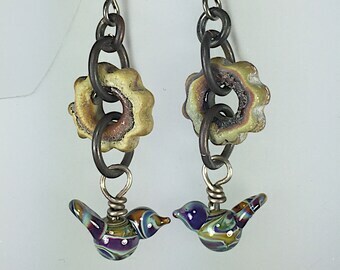 I was watching the Carol Duvall Show and they were making glass beads that day on the show. "Oh!...... THAT'S how they make the beads!!!" ...And I was off, looking for classes near-by. I found a class at the Sawtooth Center for the Arts.The teacher lit the torch and I started to drool! I knew this was for me. After the class, I applied for and received a Regional Artist Grant from the Catawba County Council for the Arts. This gave me the money I needed to get started. And so it began. I would get up in the morning and make beads, then go into work. I did this until I started selling my beads and my " other job" started getting in the way of my bead making. I started doing shows, quite the "other job" and here I am over 15 years later doing something I love. I have found my passion and I feel like the luckiest person in the world.